June Alpert | MS, RD, CDN | 516.869.5563 – Artificial Sweeteners: Not so sweet?!? 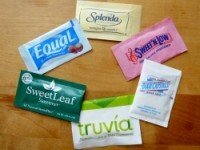 Artificial Sweeteners: Not so sweet?!? Discovered: 1879, first sold to the public in 1884, but became popular during sugar shortages in World War I. How it’s made: Anthranilic acid, nitrous acid, sulfur dioxide and chlorine are combined with ammonia. Flavor: About 300 times sweeter than sugar. Its pronounced sweetness comes on immediately with a slight bitter or metallic aftertaste. The most common artificial sweetener in soda. Discovered: 1965, first sold to public in 1981. How it’s made: The amino acids aspartic acid and phenylalanine are combined with methanol, an alcohol. Flavor: 200 times sweeter than sugar. It has a very forward, sweet taste with a sharp, clean finish. The best-selling tabletop sweetener in the United States. Popular with bakers and food manufacturers. Discovered: 1976, first sold to the public in 1998. How it’s made: Sugar is chemically altered by the addition of chlorine. Flavor: 600 times sweeter than sugar. It lacks the sour bite or bitterness in some others. Still tastes like an artificial sweetener, but with a barely noticeable aftertaste. Extracted from plant leaves, a highly purified form was approved recently as safe for use in food. Discovered: Centuries ago, first sold for general use in 1971 in Japan. How it’s made: Sweetening agents called glycosides are removed from the leaves of the stevia plant. Flavor: 300 times sweeter than sugar. Its flavor is slow to start and can have a pronounced aftertaste that some describe as licorice or menthol. New versions have tamed that somewhat. Are artificial sweeteners safe to consume? Many people are wary of artificial sweeteners and believe that they can cause a variety of health problems, including cancer. This is in part due to studies conducted in the 1970’s, which linked saccharin to bladder cancer in laboratory rats; this was later found not to be applicable to humans since we utilize a different mechanism to break down saccharin. To date, the Food and Drug Administration (FDA) has labeled the aforementioned sweeteners as GRAS or generally recognized as safe substances and approved their use. The FDA has also established acceptable daily intakes for each sweetener; they are significantly higher than anyone would normally consume in a given day (45 packets of saccharin, 75 packets of aspartame, 23 packets of sucralose, and 27 packets of stevia). Although the FDA has approved their use and the link between them and cancer has not been proven, there should still be caution when using artificial sweeteners. A number of studies have found that artificial sweeteners may be linked to increased risk for metabolic syndrome, type 2 diabetes and gastrointestinal disorders. Sugar Alcohols: What are they? Other alternatives to table sugar are sugar alcohols, which include substances like: erythritol, xylitol, mannitol, and sorbitol. Sugar alcohols provide about two thirds to half of calories in regular sugar. They are more slowly absorbed in the bloodstream than regular sugar, and do not raise blood sugar levels as quickly. Sugar alcohols are naturally found in certain fruits and vegetables, but they can also be used as sweeteners. Since they are not as sweet as artificial sweetener, sugar alcohols are often used in combination with certain artificial sweeteners. For example, the sweetener brand known as Truvia uses a combination of erythritol and stevia. Many foods labeled as diet, no sugar added, or sugar-free use such combinations of sugar alcohol and artificial sweeteners. These products still technically have sugar and carbohydrates, so you should be cautious. Sugar alcohols are also best used in moderation, since they contain calories and may cause bloating and diarrhea if they are consumed in excess. What sweetener should I choose? Artificial sweeteners are very appealing because people believe sugar-free foods and beverages may assist in weight loss. These sweeteners can provide a no-calorie alternative to a high-calorie, sugary beverage, thus theoretically limiting caloric intake. However, this may not necessarily be the case. There have been several studies that suggest that consumption of artificial sweeteners may impact our ability to associate sweetness with caloric intake. Consequentially, we may begin to crave more sweet foods to satisfy this caloric deficiency created by the artificial sweetener. This may negatively impact our food choices and lead to weight gain. Sugar alcohols are not any better. Their major flaw is that they still have calories; so they are not a great substitute for regular sugar or artificial sweeteners. Although it is best to try to avoid artificial sweeteners whenever possible, they are most likely safe to consume in moderation. If you are going to use these sweeteners, we recommend that you choose stevia or stevia sweetened food and beverages. Stevia is the most natural of the sweeteners and has not been shown to be detrimental to your health. If Stevia is not available, the second best choice is sucralose, commonly sold as Splenda. If you are looking for alternatives to diet drinks, your best option is to switch to pure water, naturally flavored still or sparkling waters, or unsweetened herbal teas. To enhance flavor, you can try adding flavor with fresh fruit like lemons, limes, strawberries or kiwis. « Delicious and Nutritious Snack Ideas for a Healthy Summer! Added Sugar? No Thank You! The Benefits of Walking…and Tracking your Progress! Protein Bars: What to look for? Delicious and Nutritious Snack Ideas for a Healthy Summer! Time to Think About Healthy Habits for the Summer! © 2014 June Alpert | MS, RD, CDN | 516.869.5563. All rights reserved.